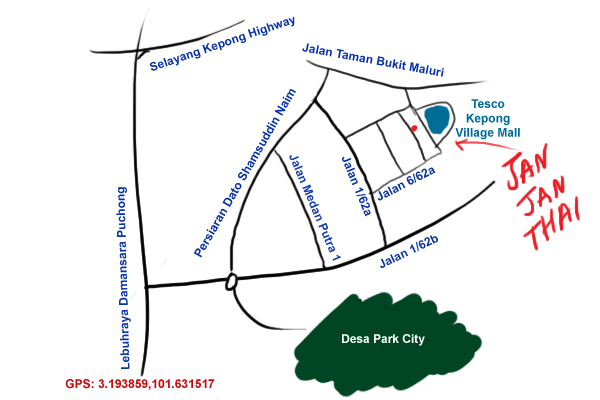 I don’t often venture out to Jinjang, in fact, Jinjang is sort of a place we always joked about as a “kampung” within KL. 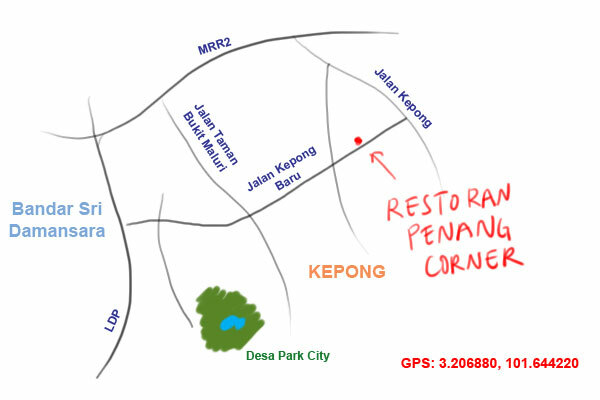 Whenever we see a particularly badly dressed young female, we’d say that she must be from Jinjang. 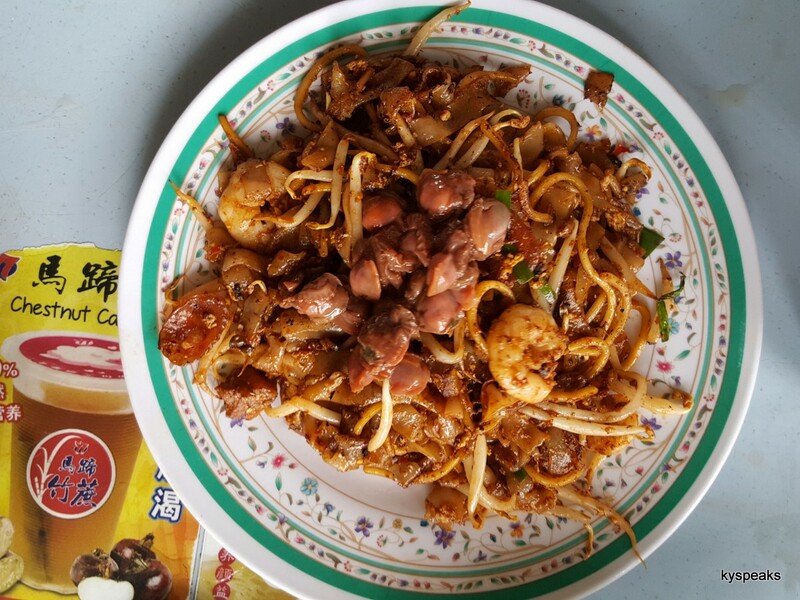 But like many older part of the Klang Valley settlements, Jinjang, and the whole Kpong area, spots some pretty good old school eateries, and Restoran Seafood Ho Kee is one of them. We were brought here by Haze’s aunt, a lady who is well versed with good old fashion Chinese food around the city, often with very reasonable pricing too. She was also the one who introduced us the equally good Zhen Liew Siang restaurant at Sentul. 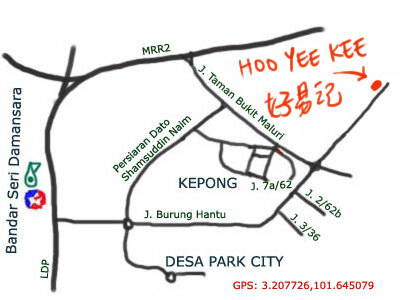 Ho Kee is located at a row of shop lot on Jalan 1/32 at Jinjang, which is just off Jalan Kepong. The restaurant has a pretty simple set up, with plastic chairs, wooden tables, and plastic liners. Surprisingly, it is also air conditioned and smoke free. 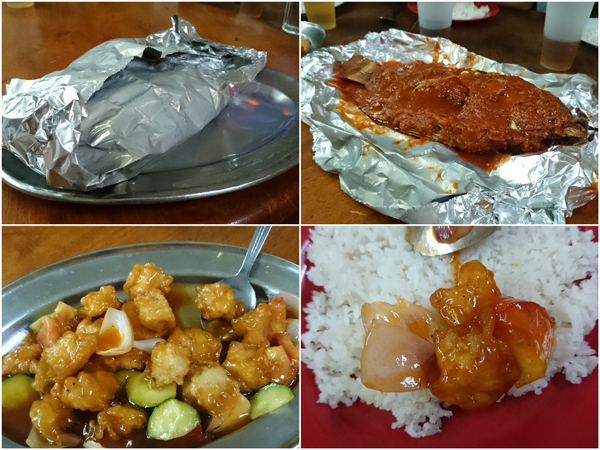 One of the speciality dishes here is their sambal fish, with tilapia coated in generous amount of sambal all wrapped up in aluminium foil. The whole concoction is then lit up with a bit of alcohol when serving, probably a bit gimmicky and unnecessary. That doesn’t matter tho, cos the fish was very delicious with the potent sambal, and goes superbly with steamed rice. The kulou yok (sweet and sour pork) here is definitely one of the bests I’ve had anywhere, we ended up ordering an extra serving. Crispy yet juicy pork with those savoury tomato sauce, yummy! 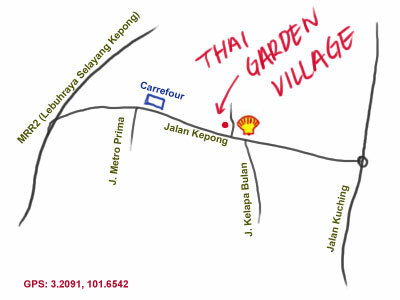 Another dish on my must-order list would be their steamed kampung chicken with ginger. 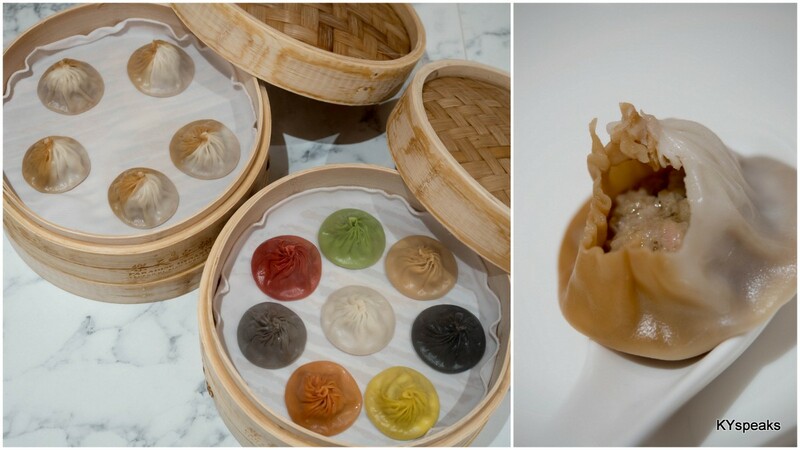 This version is as good as the one we had at Bukit Tinggi’s Loong Sing restaurant, the minced ginger will surely open up your sinus, in a good way. 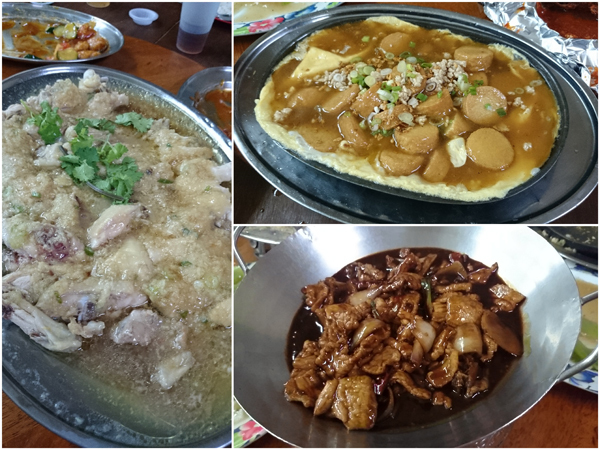 Pork belly with salted fish is worthy worthy dish, but one that is perhaps not the best I had, for a better version, try Lucky Loke at PJ SS3. The Japanese tofu with egg provided a welcoming change in taste, a more moderate note to balance out the stronger tasting dishes. Ho Kee also offers one of the rarer dishes out there – fried cuttle fish with dried chili (in Cantonese “si jiu chau yau”, also means getting fired from work). The cuttle fish perfectly cooked, fresh tasting and crunchy while not being rubbery, the flavour of dried chilli and ginger permeated in the seafood, making a uber delicious choice. 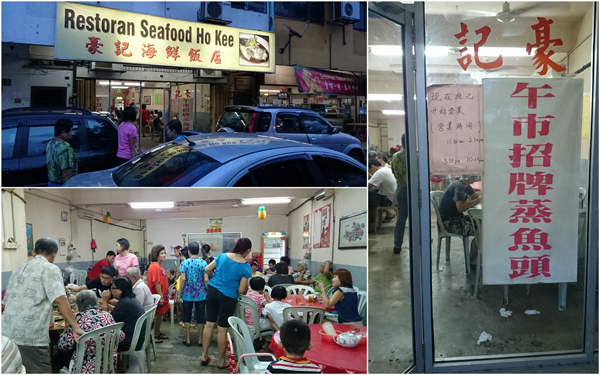 If you want a good old fashion Chinese cuisine and don’t mind a bit of a wait (It was some 45 minutes for us), give Ho Kee a try. The owner/operator/chef cooks every dish, ensuring quality though sacrificing time. 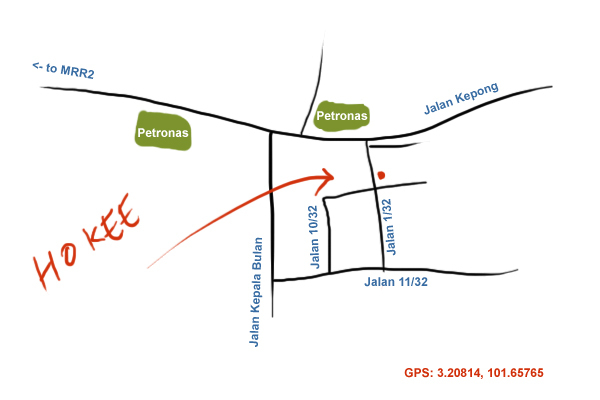 Pricing is rather reasonable as well, I believe it was less than RM 20 per pax. 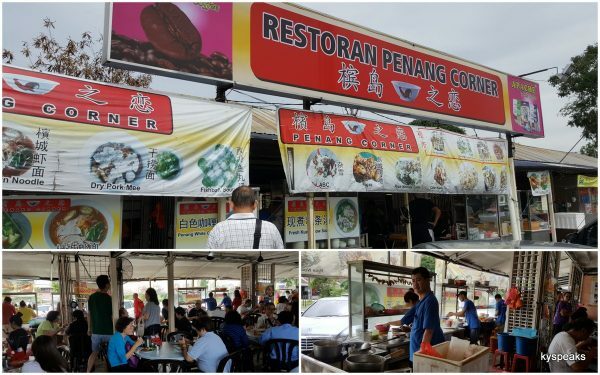 Several weeks ago I managed to convince the girls to try a new place, and we ventured out to the land of gangsters that is Kepong. 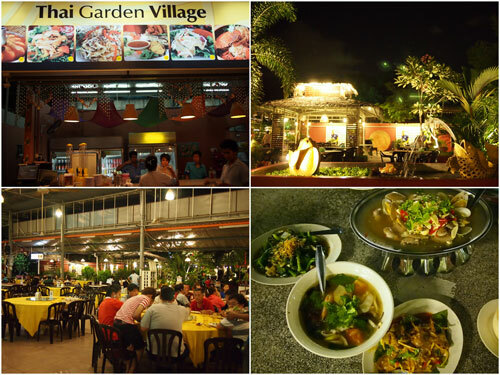 We past by the glamorous Desa Park City and turned into the older part of Kepong where steamboat restaurants are aplenty and finally arrived at where we were going to have dinner – Jan Jan Thai Restaurant. 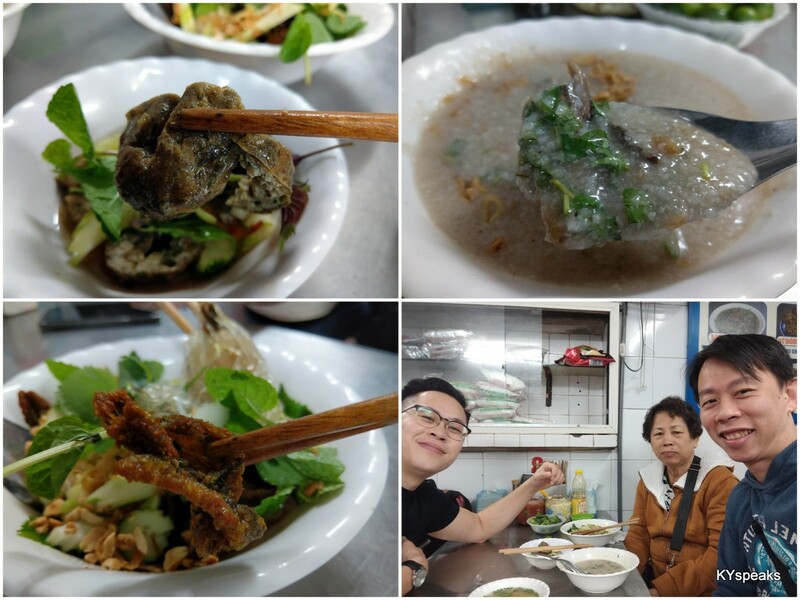 There’s an on-going healthy debate as to if Jan Jan or Janwa offers better Thai dishes, but for the purpose of this trip we’re not going to worry too much about that. 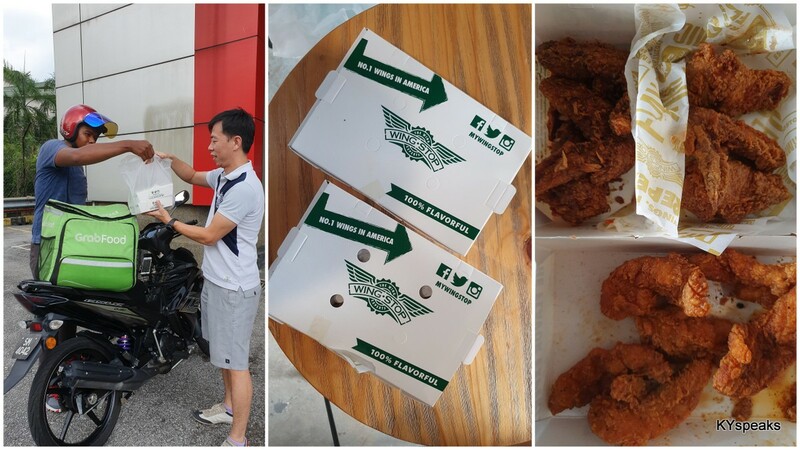 Once we found an empty table and made our order, which took a while on a weekend, food did not take very long to be served. 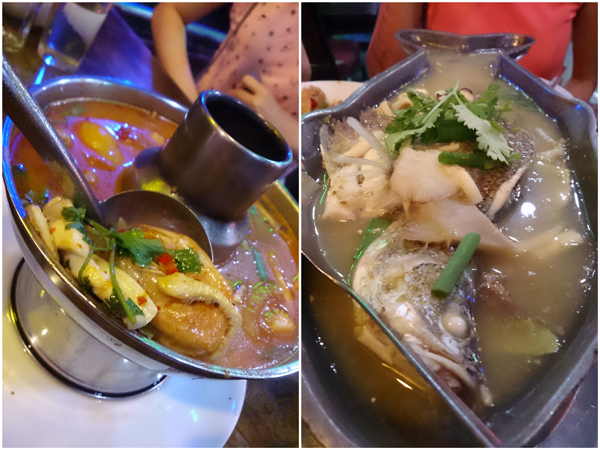 Seafood tomyam soup (RM 16-29) comes in either clear or red, and we opted for the latter, more chili laden variety. 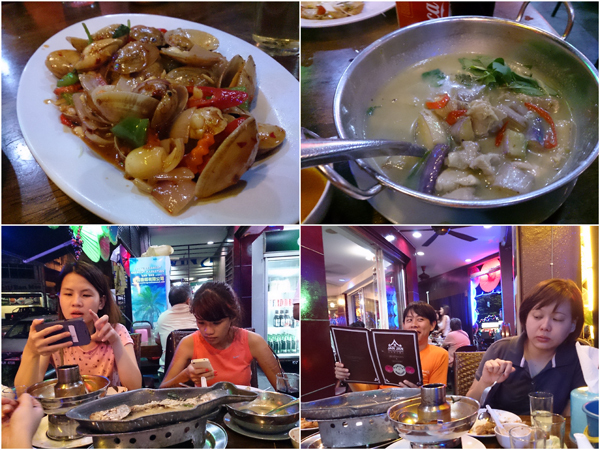 It was hot, spicy, and filled prawns, squid, fish, tomato, and more. Perfect dish for us since it was raining so heavily. The Thai style steamed barramundi (market price) turned out to be pretty good dish too. The fish was fresh and the soup positively sour and flavorful. 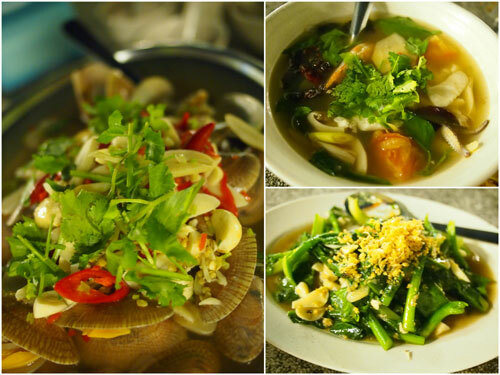 This dish is not quite De Chiengmai‘s standard, but it holds its own. Thai golden lala (RM 17) was my favorite dish of the night. The shellfish were big and juicy, and I particularly love the unique Thai style sauce that the dish came with. It was a combination of sweet, spicy, with a hint of sourness. Very different any Chinese or Malay style preparation. The disappointing dish turned out to be the Thai green curry (RM 12). I love my green curry thick and flavorful, but this one was just watery and very sweet. We took a few spoonful but otherwise left the dish almost untouched. 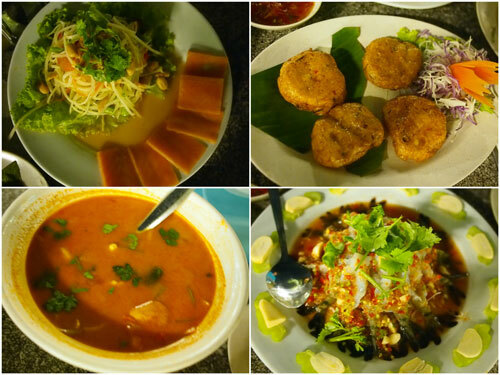 There are definitely more dishes at Jan Jan Thai that I want to try on other visits – petai prawns, deep fried brinjal, paku with belacan, mango chicken, bbq crab and Thai curry crab all sounds very enticing. I’ll just have to remember not to order their green curry again. 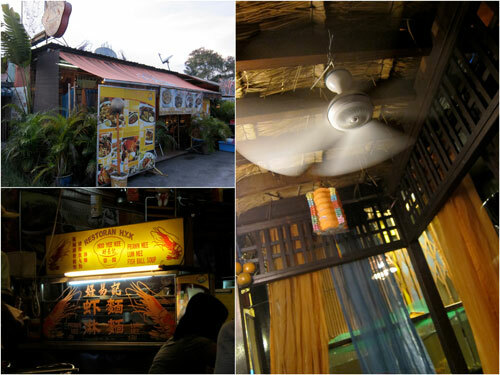 I’ve spotted Hoo Yee Kee plenty of times while on the way to one of the better late night bak kut teh places at Kaka BKT in Kepong, what captured my attention was the big neon sign of a prawn over the roof of the hawker shag turned psychedelic dining area. Don’t be fooled by the exterior of this place. From afar, it almost look like some air conditioned high class restaurant, but in actual fact it is just a highly renovated stall with a touch of quirkiness in design. This means that it is somewhat cute, but lacking in total environmental protection during thunderstorms, for example. 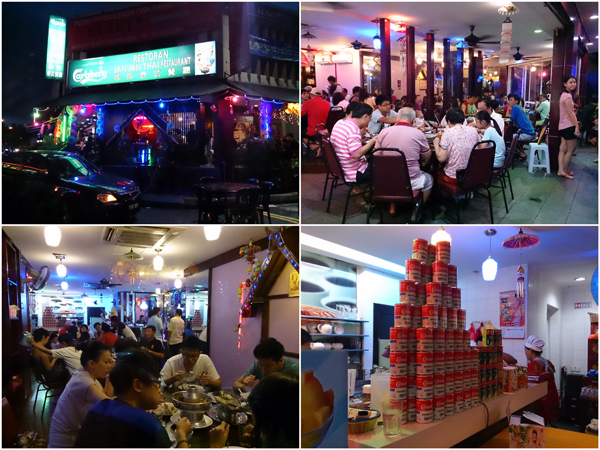 The menu is pretty extensive, lam mee, prawn mee, various sorts of drinks, chicken rice (if I remember), and a few other stuff. We ordered pretty “up market” noodle for both of us, while the “normal” meal starts from around RM 4.50, as you would expect from most hawker centres. 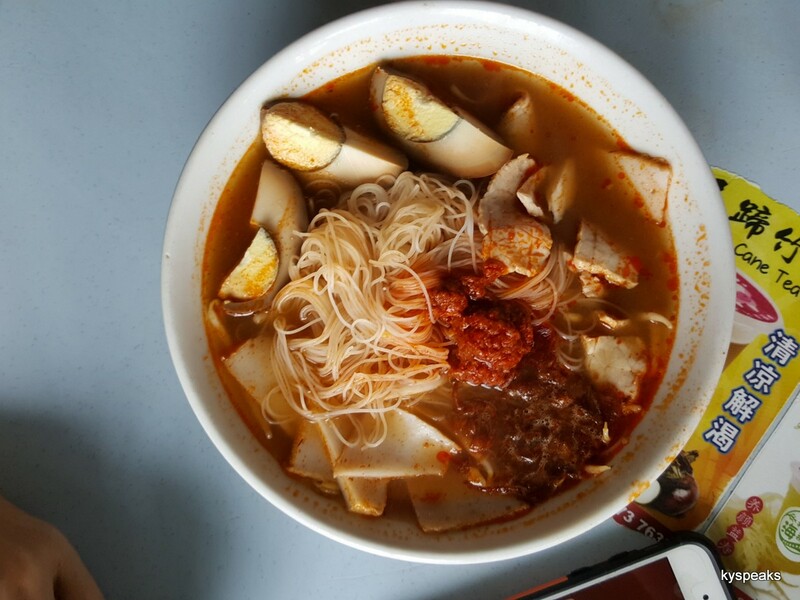 This plate of lam mee with crab (RM 18) was what Haze ordered. This dish took a little while to serve, not entirely surprising since they had to cook the crab from scratch. 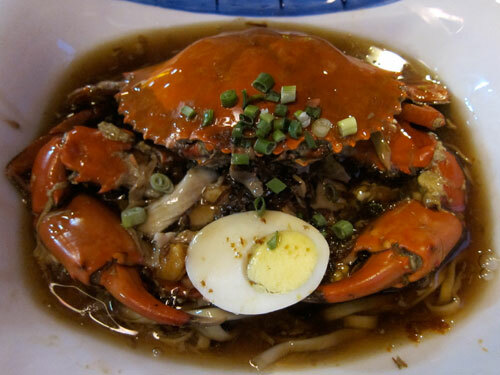 The end result is a sweet tasting crab sitting on top of lam mee, with a half a hard boiled egg and all the other usual lam mee ingredients. The crab made the broth especially tasty too! It was very good. As for me, I went with their prawn mee with meat (RM12, normal RM 4.50). 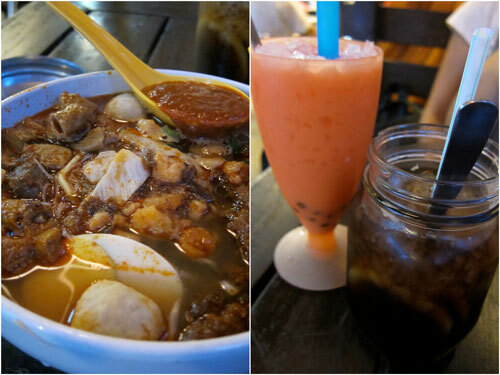 It came with a couple pork balls, pork slice, ribs, and a lot of intestine which I liked. 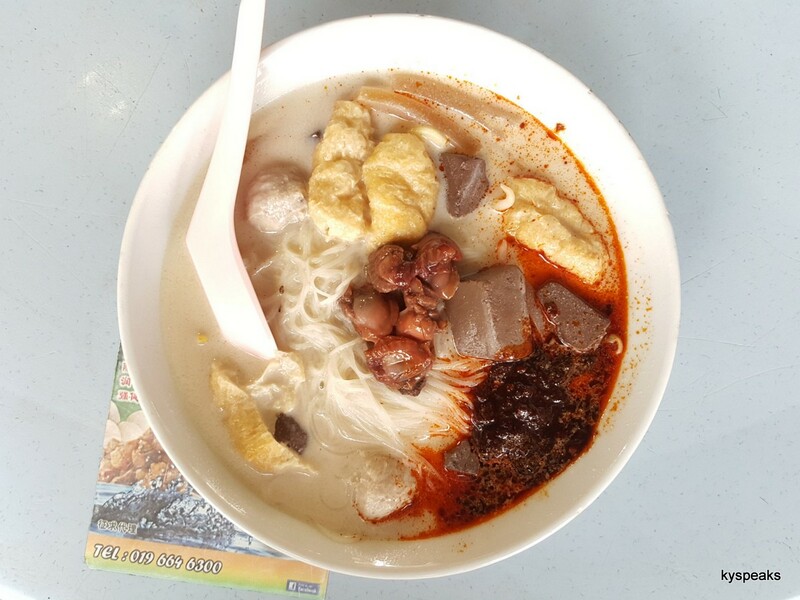 The soup was a tad too sweet for me but otherwise a decent bowl of prawn mee. I still prefer the version at Yon Lee, TTDI to be honest. 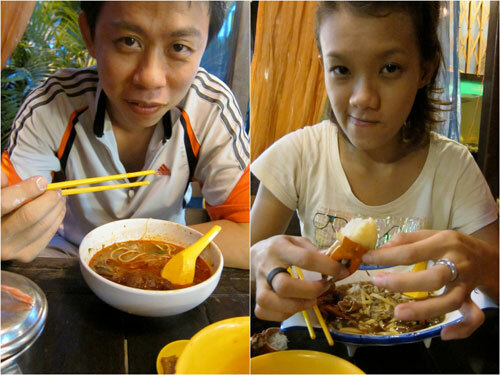 It wasn’t bad, it just wasn’t any impressive, not especially after I’ve seen the crab lam mee.